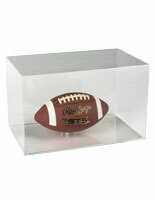 Common Size (w x h x d): 13" x 5.5" x 7"
The 1:18 display case is constructed from a 1/8" acrylic. This product can accommodate models of various sizes. The cover of the 1:18 display case lifts off easily to allow access to items inside. Black base color provides a neutral ground, ensuring that models stand out. 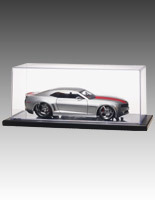 This acrylic box, 1:18 display case is designed to show a model car. These boxes are excellent for exhibiting other custom scale vehicles. Several small diecast hot wheels fit inside the unit. Use this box to feature nascar collectibles and other car paraphernalia. These shadow boxes effectively present collectibles other than a vehicle as well. 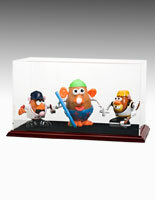 Small glass figurine collections or even wood toys can fit inside this 1:18 display case that has a black base. This acrylic box has versatility which any collector will appreciate. The 1:18 display case, like a plastic showcase, is easy to open. Users need only lift the clear top off to place a scale nascar model inside. 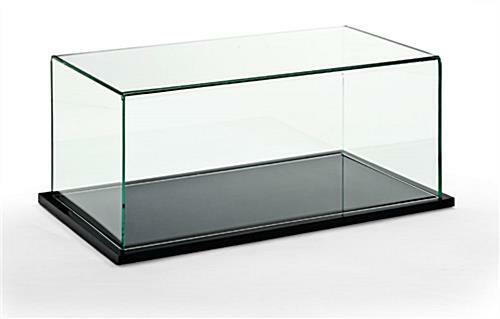 This 1:18 display case that is rectangular features a black acrylic base. A custom car will have great visibility sitting on the glass-like surface. The 1:18 display case will fit anything up to 12"x5"x6". 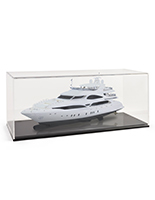 Scale models of all kinds are sure to be noticed when featured inside these shadow boxes. 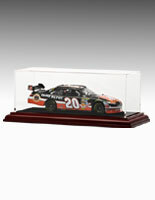 This acrylic 1:18 display case is a superb alternative to showcases made of glass and wood, as they are much less expensive. 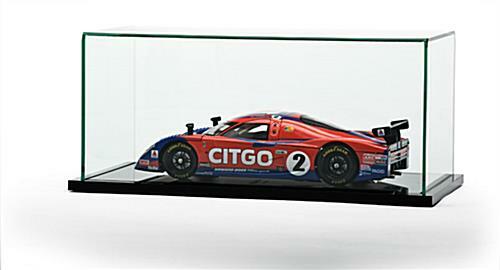 Custom boxes are unnecessary, since a wide scale of diecast cars and other collectibles can fit inside these showcases. 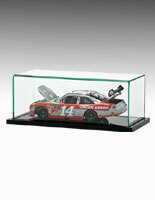 The deluxe 1:18 display case that is for a scale model is a must have for any nascar collector. Hot wheels enthusiasts will like the way this unit enhances a small diecast car assortment. 13.8" x 6.0" x 7.8"
12.8" x 5.5" x 6.7"